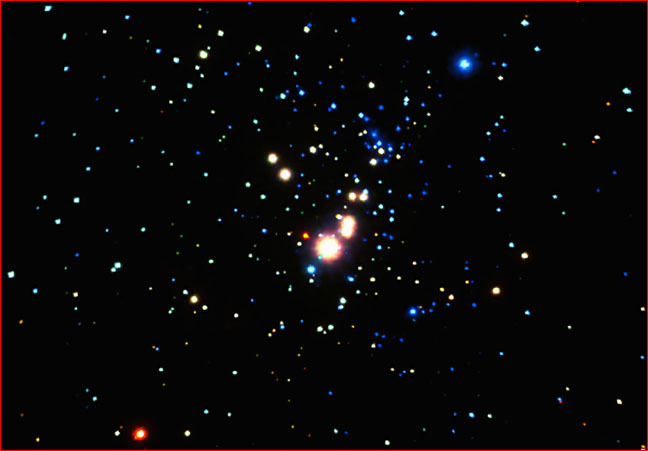 Enigmatic young stars, born in a "nursery" in space, have been found to emit high energy X-rays--a surprise to astronomers, but another predictable finding in an Electric Universe. Plasma-cosmology theories tie the flares to the formation processes of stars and of planets. Stars form where an electric current is squeezed by its own magnetic field until it becomes unstable. Then it pinches into a series of spheres that pull in matter and become centers of glow and arc discharges. This is why star formation occurs in groups, often in lines, and in the highest-energy regions of a galaxy. Similar electrical processes form planets. Because plasma is complex, there are several possible mechanisms for electrical planet formation. Any one (or even all) may be at work. The solaria binaria concept of Alfred de Grazia and Earl Milton has planets form along a plasma bridge between a star and a companion star. This theory predicts the recent discovery of a plasma bridge stretching between the red giant star Mira and its white dwarf companion. Wallace Thornhill’s theory has planets ejected electrically in the equatorial plane of the star and moons ejected in a similar manner from the equatorial plane of gas giants. (Our own moon, which doesn’t orbit in the equatorial plane, was captured.) Anthony Peratt has planets form in polar-aligned groups of 7 to 9 along the second current filament that parallels the filament in which the star forms. In the lab, matter is concentrated into spheres at the center of toruses that are stacked along the axis of the filament. The spheres remain in polar alignment as long as the discharge is active, and then they scatter “like buckshot” when it quenches. All three of these theories assume that the electrical activity observed in young stars plays an active role in forming planets as well as in forming stars. A corollary to these theories is that, after forming, the stars and planets continue to be the focus of lower-energy electrical activity. This persistent connection to galactic plasma circuits could explain the excess energy—more than what’s received from the sun—given off by most of the planets. And the possibility of electrically heated planets disrupts the narrow conventional calculations of a “habitable zone” in which water stays liquid: Depending on the current, a habitable planet could be anywhere. Furthermore, in view of the “life-like” behavior of plasma and the “plasma-like” behavior of life, the density of life in the universe could be surprisingly greater than hitherto imagined. For the first time in two centuries, scientists can develop new ideas of how stars and planets form based on observational and laboratory data, ideas that take into account the plasma activity that has surprised astronomers with every new discovery of the space age.